Traffic accidents kill more than 1.2 million people every year, nearly the same amount that die from HIV/AIDS. 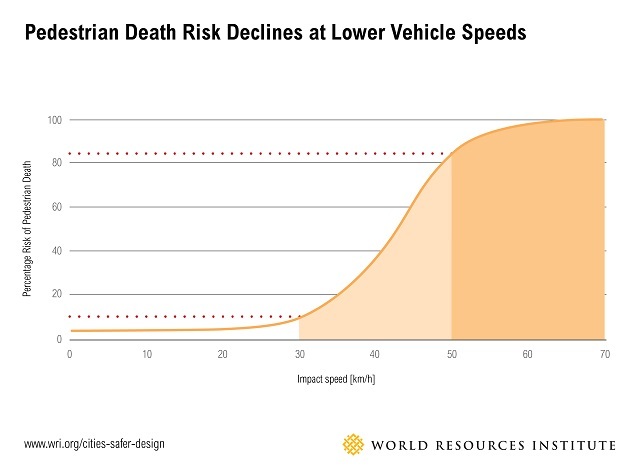 But there’s an undervalued approach to making the world’s roads safer—good urban design. 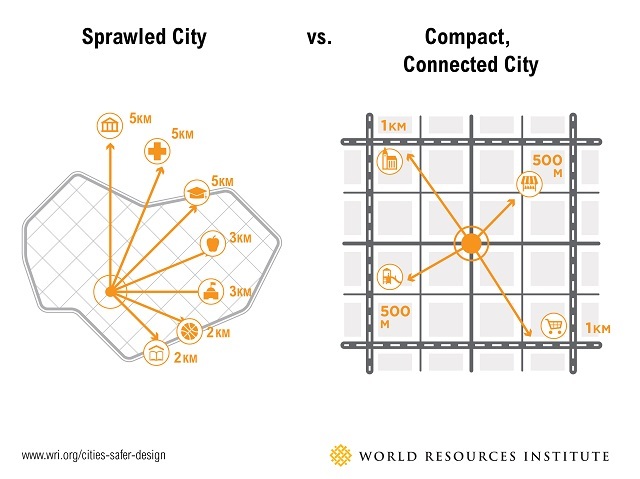 Cities that are connected and compact are generally safer than cities that are spread out over a large area. Compact Stockholm and Tokyo have the lowest traffic fatality rates in the world—fewer than 1.5 deaths per 100,000 residents. Sprawling Atlanta, on the other hand, has a death rate six times that, at 9 fatalities per 100,000 residents. Cities should aim for smaller block sizes, pedestrian-oriented streets, and dense housing that allows for convenient, walkable access to transport, entertainment and public spaces. Doing so reduces the need for car travel and ensures a safe space for walking and cycling. 2. Slow down road traffic. Lower automobile speeds, particularly below 25-31 miles per hour (40-50 kilometers per hour) drastically reduce the risk of fatalities. Cities can implement low-speed zones and “area-wide traffic calming,” including speed humps, curves in the road called chicanes, curb extensions and raised pedestrian crossings. Research shows that speed humps can reduce vehicle speeds from more than 22 mph (36 kph) to less than 15 mph (25 kph). Paris, for example, has been using this kind of tool to design roads citywide to meet 30 kph (19 mph) speed limits. 3. Ensure main streets are safe for everyone, not just cars. Ensuring safety is particularly important for main roads, where pedestrians and motorists often mix. A growing movement for “complete streets” means that all types of users have safe crossings and dedicated road space. For example, refuge islands and medians give pedestrians a safe place when crossing the road. 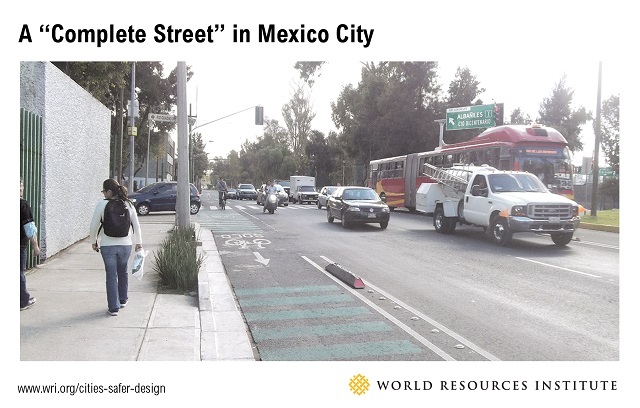 Mexico City found that for every one meter increase in unprotected road width, pedestrian crashes increased by 3 percent. The city recently rebuilt its Avenida Eduardo Molina as a complete street, featuring dedicated transit, bike lanes and a green central median for pedestrians. Similar but less dramatic changes in street design in the city have resulted in a nearly 40 percent drop in fatalities. 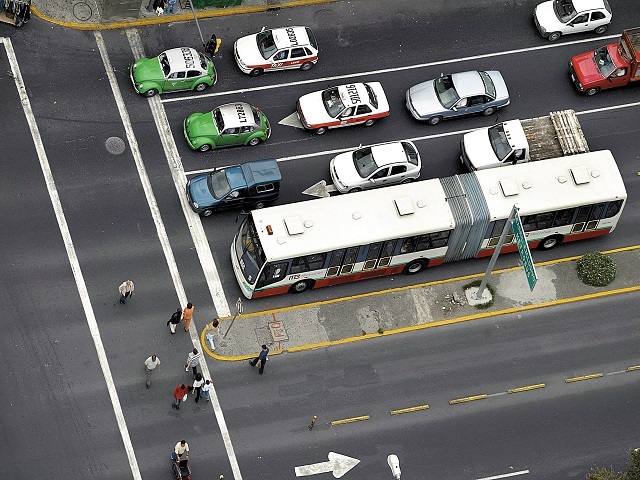 Avenida Eduardo Molina in Mexico City—an arterial with dedicated bus lanes, protected bike lanes, rebuilt sidewalks, and a green central median at some segments—accommodates mass transport, mixed vehicular traffic,bicycling, and walking. 4. Create dedicated space for pedestrians. More than 270,000 pedestrians lose their lives each year on the world’s roads. If pedestrians lack quality space, they are exposed to greater risk. Basic sidewalk space is necessary, but pedestrian-only streets and street plazas can also be effective tools for protecting walkers. 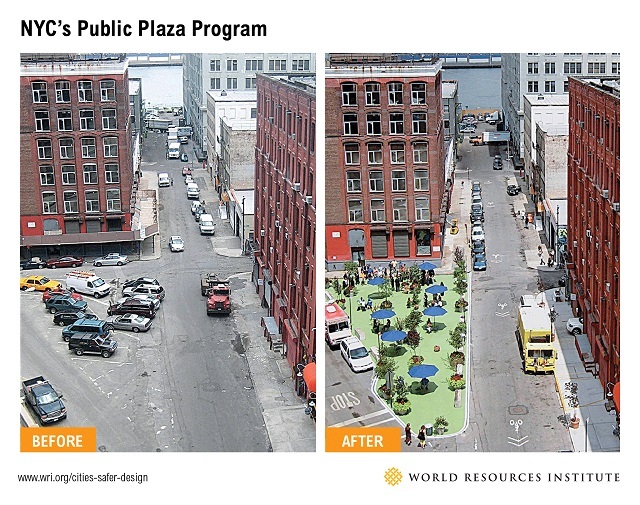 In the past few years, New York City has led a global shift toward eliminating street spaces for cars and turning them into “street plazas,” improved sidewalks and car-free areas. For example, a large section of Times Square is now only accessible to walkers and cyclists. The city saw a 16 percent decrease in speeding and a 26 percent reduction in crashes with injuries along streets with pedestrian plazas. 5. Provide a safe, connected network for cyclists. Studies from several cities find that injury rates go down and more people bike when there is dedicated infrastructure like off-street trails and dedicated bike lanes. 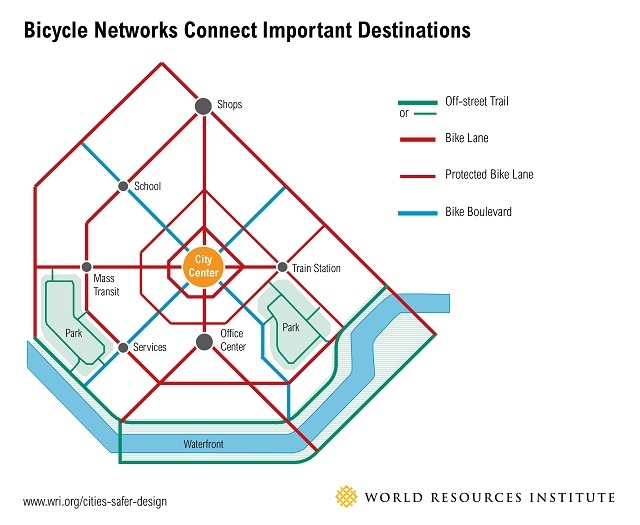 These cycling networks should also connect residential areas to business and retail, schools, parks and mass transport. Bogota, Colombia found that adding more than 100 km (62 miles) of bikeways helped reduce bicyclist deaths by 47.2 percent between 2003 and 2013 , and increased bicycle use from just over 3 percent of all daily trips to over 6 percent. 6. Ensure safe access to high-quality public transport. High quality public transport carries more people, and experiences fewer crashes than private vehicle travel. Research shows that a bus rapid transit (BRT) system can reduce traffic deaths and severe injuries by 50 percent. 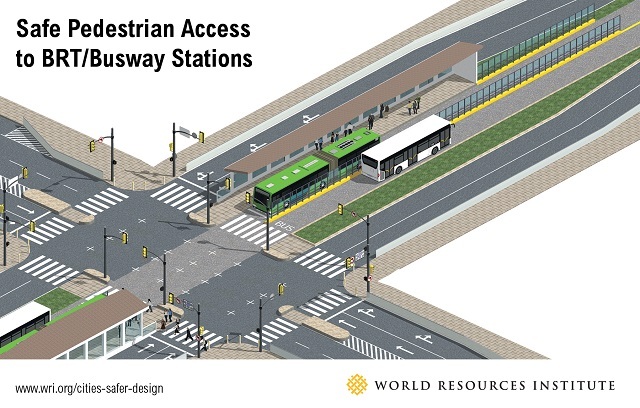 It’s not enough to just provide this public transit, though—city planners must also ensure safe access for commuters. Belo Horizonte, Brazil recently launched MOVE BRT, carrying an estimated 700,000 passengers per day. The city rebuilt streets in its center and created dedicated bus lanes with clearly marked crossings and easy pedestrian access. This system makes it safe for commuters to ride the bus, as well as to wait for and get onto the bus. Pedestrian access to a median BRT station. 7. Use data to detect problem areas. Cities can use data analysis to identify key streets where all the above solutions can be integrated. 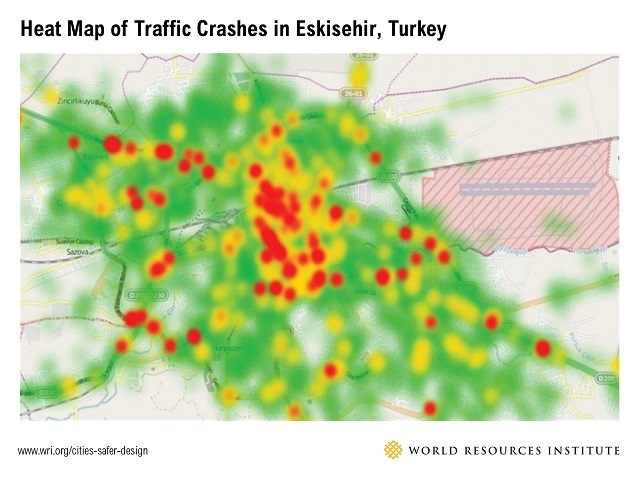 This means having good traffic crash data that can be mapped and analyzed, seen here using the PTV Visum Safety software to create heat maps of crash locations. For example, London used data analysis and mapping to analyze its crash data and learned that a rise in cyclist deaths came from crashes with large trucks delivering goods into the city center. The city has since developed a pilot program to reschedule deliveries for low-cyclist hours. We live in a rapidly urbanizing world, with cities expected to hold 70% of the global population by 2030. Designing safe cities now can protect current residents as well as those to come. To learn more about how urban design can make cities safer, read the report Cities Safer by Design here.